Welcome! 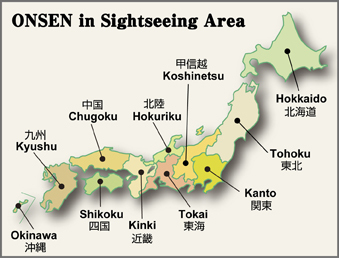 Onsen is one of the necessaries of travel in Japan. Hot spring and Japanese-style hotel are called "Onsen" and "ryokan" respectively in Japanese. On this Web site, the words "onsen" and "ryokan" are used to describe them. This Web site gives information about Japanese great Onsen to people all over the world. The purpose of this Web site is to make the visitors familiar with Japanese Onsen, wonderful Onsen resort, Japanese traditional ryokan, and Onsen culture exhaustively. a quiet traditional Onsen resort at World Heritage Site called "Kumano-Kodo" . Ryokan with an excellent Onsen the famous politicians and writers in Japan used to love. The best public bath in Beppu, which is the biggest Onsen resort in Japan. It is called "mysterious lake" as it is often shrouded by fog. This website is in preparation. Japanese Onsen (hot spring) is famous worldwide. In Japan there are over 3,000 Onsen areas and over 22,000 places where you can enjoy Onsen, including the accommodations and the public baths. various chemical properties, its natural surroundings, and its culture that has been developed for a long time although they used to connect Japan with Kyoto, Tokyo, and Mt. Fuji. When you find yourself enjoying Onsen, you also realize another aspect of Japan. Nippon Onsen Research Institute is a “private” enterprise that not only examines and researches Onsen and tourism but also gives consultations about Onsen. We maintain the principle of Onsen in order to remain neutral and make profit and sociality go together without being affected by any external influence and restriction. Copyright ©　2007-2008 Nippon Onsen Research Institute Co., Ltd. Tokyo Japan.